MLK, Sr. Heritage Trail Unveiling & Commemorative Wall Plaque Dedication is an Historical Event to Remember. On Thursday, October 8, 2015, the City of Stockbridge honored Martin Luther King, Sr. by unveiling the street sign MLK, Sr. Heritage Trail, recently named in his honor and also dedicated a Commemorative Wall Plaque acknowledging Stockbridge as the ancestral home of the King family. 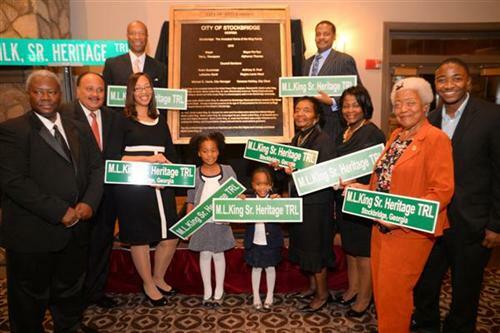 On Thursday, October 8, 2015, the City of Stockbridge honored Martin Luther King, Sr. by unveiling the street sign MLK, Sr. Heritage Trail, recently named in his honor and also dedicated a Commemorative Wall Plaque acknowledging Stockbridge as the ancestral home of the King family. The ceremony took place at the Merle Manders Conference Center. Members of the King family who attended the ceremony includes Christine King Farris, daughter of Martin Luther King, Sr. and sister of Nobel Peace Prize recipient and Civil Rights Leader, Martin Luther King, Jr., along with Martin Luther King, III- son of Martin Luther King, Jr. The ceremonial program included presentations by Senator Emanuel Jones, Senator Gail Davenport, Representative Demetrius Douglas, and Representative Andy Welch. Additional attendees included Clayton County Chairman Jeffrey Turner, Henry County Board of Education Superintendent Rodney Bowler, City of McDonough Mayor Billy Copeland, and representatives from Ebenezer Baptist Church and Floyd Baptist Church, where King Sr. pastored. Senator Emanuel Jones, who is also Chairman of the State of Georgia Martin Luther King, Jr. Advisory Council, presented a plaque to the City of Stockbridge, in recognition of the city’s initiative. Representative Demetrius Douglas presented a resolution to the city, acknowledging the MLK, Sr. Historical Preservation Committee. Alphonso Thomas, Mayor Pro Tem and Chairman of the Martin Luther King, Sr. Historical Preservation Committee, spearheaded the request for approval from the City Council in January of this year. The Committee whose members are: Tyrone Anderson, Kenneth Banks, Vincent Beazer, Rev. E.C. Cochran, Sr., Marilyn Flynn, Oswin Jackson, Mike Moon, Mildred E. Reed, Lee Stuart and Adam Worsham, was formed and tasked with locating the street(s) to be renamed. On Monday, September 14, 2015, the City Council approved the renaming of Berry Street and Railroad Street to MLK, Sr. Heritage Trail. The commemorative wall plaque will be permanently displayed in City Hall and references the King family’s ancestry in Stockbridge. The plaque contains history of Martin Luther King, Sr. attending the Rosenwald School and preaching his first sermon at age 15 at historic Floyd Chapel Baptist Church, with both sites along the route of the newly named MLK, Sr. Heritage Trail.